Background and objectives Patients with decompensated cirrhosis rarely receive palliative and supportive care interventions, which are routine in other life-limiting diseases. We aimed to design and evaluate a prognostic screening tool to routinely identify inpatients with decompensated cirrhosis at high risk of dying over the coming year, alongside the development of a supportive care intervention. Design Clinical notes from consecutive patients admitted as an emergency to University Hospitals Bristol with a diagnosis of cirrhosis over two distinct 90-day periods were scrutinised retrospectively for the presence or absence of five evidence-based factors associated with poor prognosis. These were analysed against their ability to predict mortality at 1 year. ‘Plan-Do-Study-Act’ (PDSA) methodology was used to incorporate poor-prognosis screening into the routine assessment of patients admitted with cirrhosis, and develop a supportive care intervention. Results 73 admissions were scrutinised (79.5% male, 63% alcohol-related liver disease, median age 54). The presence of three or more poor-prognosis criteria at admission predicted 1-year mortality with sensitivity, specificity and positive predictive value of 72.2%, 83.8% and 81.3%, respectively, and was used as a trigger for implementing the supportive care intervention. Following modification from six PDSA cycles, prognostic screening was integrated into the assessment of all patients admitted with decompensated cirrhosis, with the supportive care intervention (developed simultaneously) instigated for appropriate patients. Conclusions We describe a model of care which identifies inpatients with cirrhosis at significant risk of dying over the coming year, and describe development of a supportive care intervention, which can be offered to suitable patients in parallel to ongoing active management. In the UK, liver disease causes approximately 2% of overall deaths and is the third most common cause of death in people of working age.1 Antiviral therapy or abstinence from alcohol can result in significant improvements in liver function, and transplantation offers the potential of cure for some patients; however, the risk of death among patients with decompensated cirrhosis remains high. A high proportion of patients with liver disease die in hospital (73% in England9), with the terminal admission commonly preceded by multiple inpatient episodes in the final year of life.10 ,11 In parallel with consideration of a patient's therapeutic options, these admissions afford the opportunity to assess disease stage and discuss prognosis. This study describes the design, validation and implementation of a prognostic screening tool for use amongst inpatients with decompensated cirrhosis, with the aim of identifying patients at high risk of dying over the coming year. We describe the parallel development of a supportive care intervention, which can be offered to appropriate patients in conjunction with their ongoing active disease management. The tool was designed for use amongst patients admitted to hospital with a pre-existing diagnosis of cirrhosis. Based on the Gold Standards Framework criteria, we aimed to accurately identify patients in whom death was likely to occur within 12 months. We intended criteria to be simple, objective and reproducible. The 2013 National Health Service (NHS) document ‘Getting it right—improving end-of-life care for patients with liver disease’ highlighted specific, evidence-based ‘triggers,’ which could be used to prompt discussion of future care preferences.14 Following departmental discussion with consultant and junior medical staff, five of these criteria were selected and modified for use within the tool (Child-Pugh score C, two or more admissions within the last 6 months, ongoing alcohol use in the context of known alcohol-related liver disease (ArLD), unsuitability for liver transplantation, WHO Performance status 3 or 4). For patients who had not undergone formal transplant assessment, the presence of ongoing alcohol misuse in the context of previously diagnosed ArLD, age >75 and the presence of untreated extrahepatic malignancy were used as surrogates for a patient being unsuitable for transplantation. Using local databases, consecutive patients admitted to University Hospitals Bristol NHS Foundation Trust with a pre-existing diagnosis of cirrhosis (by clinical, radiological or histological criteria) over two distinct 90-day periods were retrospectively identified (periods commencing: 1 July 2013 and 1 November 2014). Clinical notes and electronic records from each patient were scrutinised. Each patient was assessed for the presence or absence of the five criteria, and scored independently by two clinicians. Where scores were not consistent, or there was insufficient information in clinical records, patients were excluded from analysis. Mortality 1 year from the date of index admission was determined through retrospective scrutiny of computerised patient records. For patients admitted more than once within the 3-month period, only the first admission was used. The ability to predict death 1 year following index admission was calculated for each individual criterion, each cumulative prognostic score (eg, total score of 3 or above) and various combinations of commonly positive criteria, through determination of sensitivity, specificity and positive predictive value (PPV). 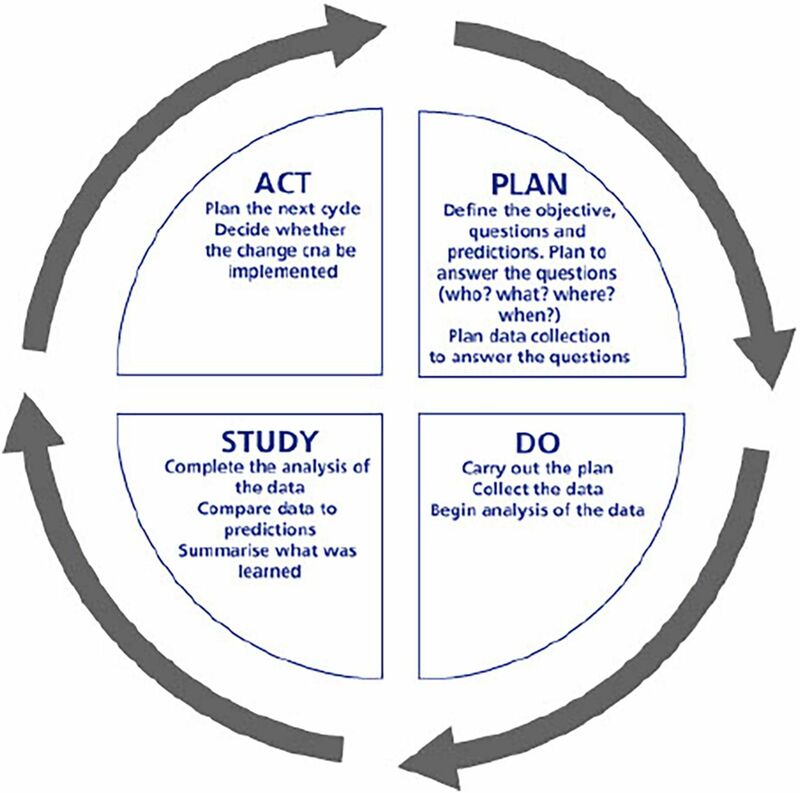 Rapid-cycle change methodology was used to integrate prognostic screening into the routine assessment of inpatients, and in development of the supportive care intervention (figure 1).15 ,16 Six ‘Plan-Do-Study-Act’ (PDSA) cycles were completed. Opinions from junior medical staff, consultants, ward and specialist hepatology nursing staff and allied health professionals were sought following each cycle. Eighty-three patients (51: period a, 32: period b) with a pre-existing diagnosis of cirrhosis were admitted over the 2 study periods, of which 10 were excluded from analysis—all due to insufficient information in clinical records. Patient demographics are shown in table 1. Accuracy in predicting mortality 1 year following admission was a key criterion in design of the screening tool. While not wanting to miss potentially suitable patients, the resource implications and clinical appropriateness of including every patient admitted with decompensation also required consideration. The proportion of patients meeting each of the individual criteria at index admission, alongside their PPV, sensitivity and specificity at predicting death at 1 year, is demonstrated in table 2. The same predictive statistical parameters are applied for cumulative scores, and various combinations of commonly positive criteria. From the starting point of a simple list of criteria displayed on the ward, the quality improvement process described above led to full integration of prognostic screening into the routine assessment of inpatients admitted with decompensated cirrhosis. The format and content of the supportive care intervention offered to patients underwent a parallel process of quality improvement. The key changes resulting from each cycle are demonstrated in figure 2. Four months following implementation, audit demonstrated that use of the prognostic screening tool had become routine with completion rates of 88.9% for patients with decompensated cirrhosis (n=21). 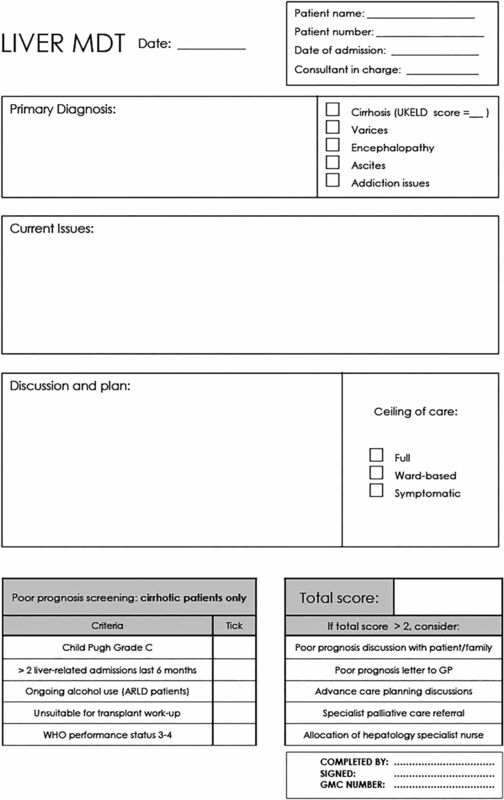 Figure 3 shows the weekly MDT discussion proforma, completed weekly for each hepatology inpatient, with the integrated prognostic screening tool. Integration of prognostic screening tool and development of supportive care intervention using rapid-cycle ‘Plan-Do-Study-Act’ (PDSA) methodology. ArLD, alcohol-related liver disease; GP, general practitioner. Integration of prognostic screening into weekly hepatology MDT proforma, completed weekly for each hepatology inpatient at the University Hospitals Bristol Trust (front and reverse of sheet). ArLD, alcohol-related liver disease; GP, general practitioner. A recent review of palliative care in advanced liver disease, and a survey of the UK health professionals managing cirrhosis in the UK both identified the need to create models of care which incorporate easily identifiable triggers for the instigation of supportive and palliative care measures in the management of end-stage liver disease.2 ,17 Pre-existing models for statistically predicting mortality in liver disease are designed with the purpose of guiding therapeutic interventions such as liver transplantation. This is the first model that uses a prognostic score to trigger a supportive care intervention among patients admitted to hospital with cirrhosis. The uncertain clinical trajectory of advanced liver disease is cited as a key reason why physicians are sometimes reluctant to involve supportive and palliative care services in patient management.2 While not wanting to limit access to curative or life-prolonging therapies, such an approach risks patients not being fully involved in decisions surrounding their future care, and being denied timely supportive care interventions from which they equally stand to benefit in terms of symptom control, mood and quality of life.6 Creating an intervention that runs in parallel to ongoing active management has been central in the design of this model. Patients may well be identified simultaneously as possible transplant candidates. Our analysis highlighted Child-Pugh C disease, a cumulative score of 3 or above, and the presence of Child-Pugh C disease in the presence of at least one other poor prognostic criteria as having excellent (and approximately equivalent) ability to identify patients at high risk of death over the coming year. We would consider these equally acceptable as triggers for implementation of the supportive care intervention. Our model used a cumulative score of 3 or above as the trigger for intervention. Although highly specific, cumulative prognostic scores >3 were rare (9.6%), meaning that many patients who would stand to benefit from intervention would be missed at this threshold (sensitivity 16.7%). While other units wishing to adopt the principle of prognostic screening may vary in their choice of trigger, inclusion of a Child-Pugh score within the screening tool does appear to significantly improve its predictive ability. The criterion ‘unsuitable for transplantation’ does potentially crossover with both the continuing alcohol and poor performance status criteria, meaning certain patients could be scored twice for essentially the same characteristic. Removal of this criterion from the screening tool (using a cumulative score of 2 out of 4 as opposed to 3 out of 5 as the intervention trigger) had little effect either way on the ability of the tool to predict death at 1 year (PPV 81.8%, sensitivity 75.0%, specificity 83.8%). 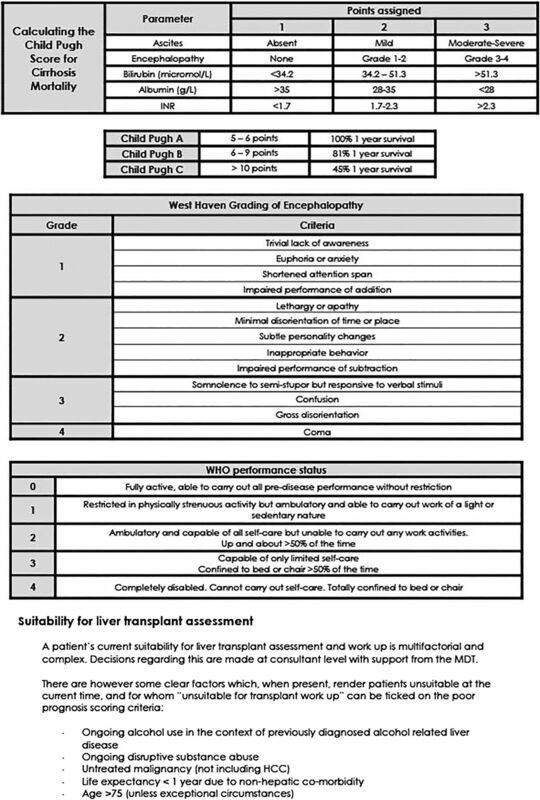 Given that predictive ability is not affected, we have found the prompt to routinely consider transplant suitability in all patients admitted with a complication of their cirrhosis to be of value, and as such have not removed it as a criterion. It may be argued that statistical analysis pertaining to the ability of a defined trigger to predict mortality is moot, and that all patients admitted with a decompensating episode should be afforded supportive care interventions. Evidence from other UK centres however suggests that, in the absence of a predefined trigger, initiation of palliative and supportive care is rare.8 Routine referral would require a substantial culture change and clinicians may reasonably demand persuasive data to alter their practice. The resource implications of initiating the intervention also make a targeted approach prudent, pending such data. Our model retains the option for clinicians to initiate the supportive care intervention outside the defined criteria, on a case-by-case basis. The quality improvement process resulted in the following package of measures being implemented for appropriate patients (‘supportive care intervention’); a consultant hepatologist led poor prognosis discussion with the patient and their family, a poor prognosis letter being sent to the general practitioner informing them of current management and expectations for treatment, involvement of the palliative medicine team to review current symptom control and offer opportunities for advance care planning, introduction and involvement of the hepatology specialist nursing team—whose contact details were made available to patients and their family following discharge. A rolling programme of training in advanced communication skills, delivered by the palliative medicine department for hepatology staff of all grades, is ongoing. Through incorporation of prognostic screening into the routine care of patients admitted with decompensation, the clinical team feel that identification of patients with advanced disease has improved, with better access to appropriate services and support, opportunities for advance care planning and improved co-ordination of ongoing community care. The outcome for patients is being investigated within a current study. We plan to develop the supportive care intervention further through increasing the involvement of community palliative care services. The quality improvement process surrounding integration of this model into routine practice was, to an extent, site specific. A weekly meeting, where all inpatients with a diagnosis of cirrhosis are discussed, provided a convenient structure around which implementation of prognostic screening could be based within our institution. Other units may use alternative structures, such as daily board rounds or nursing handovers, to identify appropriate patients, and may also wish to use an alternative ‘trigger’ for intervention based on clinician preferences and the availability of supportive and palliative care services locally. Our model only identifies patients who are admitted as an emergency. Further work to create robust mechanisms which identify patients who access services, either in the community, outpatients or via repeated emergency department visits are also required. Identification of patients likely to have a poor prognosis is only the first part of the challenge, and the question of what represents optimal onward care remains undefined. Evidence surrounding this remains scarce. Qualitative data from patients and families with advanced liver disease, and clinical trial data assessing the impact of palliative and supportive care approaches will be essential in designing services and interventions which are fit for purpose. Outside the context of end-of-life care, palliative and supportive care are seldom offered to patients with advanced liver disease, in part due to difficulties identifying patients who stand to benefit, and the absence of models which allow supportive care interventions to run in parallel with ongoing active management. The model described offers a validated template through which patients at risk of dying can be accurately and routinely identified, and offered supportive care interventions in parallel to their ongoing active management. Although the specifics of implementation will be determined by local factors, we believe the principle of routine prognostic evaluation of patients admitted to hospital with a decompensating episode to be universally transferable. Palliative and supportive care interventions can improve symptoms, quality of life and mood in patients with advanced liver disease. Outside the context of end-of-life care, patients with advanced liver disease seldom receive palliative and supportive care interventions, which are routine in other life-limiting conditions. The trajectory of advanced liver disease is often unpredictable, and identification of patients who are at high risk of dying can be difficult. We describe the design, validation, and implementation of a prognostic screening tool which, when used in routine clinical assessment, identifies patients admitted with decompensated cirrhosis at high risk of dying over the coming year with high sensitivity, specificity and positive predictive value. We describe development of a supportive care intervention which can be offered to appropriately identified patients in parallel to their ongoing active management. This is the first model which validates and uses a prognostic score to identify poor prognosis and trigger a supportive care intervention among patients admitted to hospital with cirrhosis. 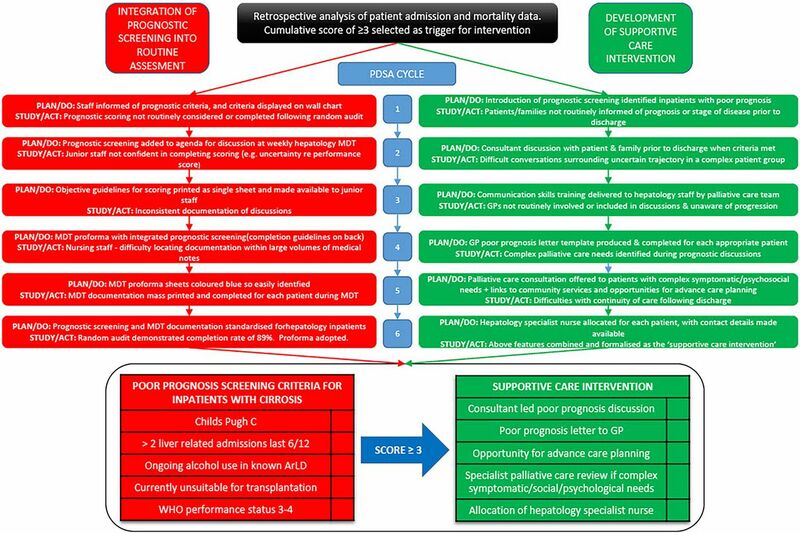 Improved and earlier identification of patients with liver disease who have a poor prognosis enables appropriate patients to be afforded the benefits of supportive interventions prior to terminal decline (by which point many potential benefits of supportive and palliative care are lost). The inherent uncertainties in the liver disease trajectory may previously have precluded appropriate patients from receiving timely supportive care interventions. By encompassing parallel ongoing active disease management within this model of care, this obstacle is overcome.
. Dying with end stage liver disease with cirrhosis: insights from SUPPORT. Study to Understand Prognoses and Preferences for Outcomes and Risks of Treatment. J Am Geriatr Soc 2000;48(5 Suppl):S122–30. Deaths from Liver Disease—Implications for End of Life Care, National End of Life Care Intelligence Network, March 2012. Hospital episode statistics—Office for National Statistics, 2007–2011. End of Life Care Strategy: promoting high quality care for adults at the end of their life. Department of Health, 2008. Getting it right: Improving End of Life Care for People Living with Liver Disease. NHS. National End of Life Care Programme. 2013. NHS Atlas of Variation in Healthcare for People with Liver Disease. Health Protection Agency. 2013. Contributors BEH led data collection and analysis and drafted the manuscript, KA, AG and RG assisted with data collection and statistical analysis, JV scrutinised and edited the manuscript, PC, FG, AJP, CR and KF assisted in design and implementation of the intervention, CAM led design of the study and critically reviewed the manuscript. Funding The study was funded by David Telling Charitable Foundation.